This is a simple project using the IC UM66. UM66 has an inbuilt beat and tone generator. This IC, with its three legs, looks like a transistor. This IC has many versions for playing different songs/beats. This project is suitable for beginners as its circuit is very simple. Â TheÂ UM66 series are CMOS IIC’s designed for using in calling bell, phone and toys. It has a built in ROM programs for playing music. The device has very low power consumption. Thanks for the CMOS technology. The melody will be available at pin 3 of UM66 and here it is amplified by using Q1 to drive the speaker. Resistor R1 limits the base current of Q1 within the safe values. Capacitor C1 is meant for noise suppression. Power supplyÂ must be between 1.5V & 4.5V .Do not exceed 4.5 V.
Speaker can be driven with external NPNÂ transistor. If transistor HE8050S is not available use any NPN transistor like BC548 or 2N2222. can ic555 timer be used in water level indicator with alarm to generate tone? if yes, can you help on how to substitute it with icum66. I have searched for icum66 in the market but cannot find one. please can i get a substitute? sir , i want that what does 66 indicates in UM66. Like Admin has stated, UM66 is designed and manufactured with those melodies. You can not reprogramme it. You need a voice recorder circuit interfaced with a amplifier circuit. It is not possible to store our own music in UM66. I will add a voice recorder circuit soon. UM66 is a 3 pin melody device. once the supply is given to pin 1 & 2 it will give continuous audio out put at pin3, which is not sufficient to drive a loud speaker, hence an additional direct coupled amplifier is added to drive a small speaker. i want data sheet about the working of um66? 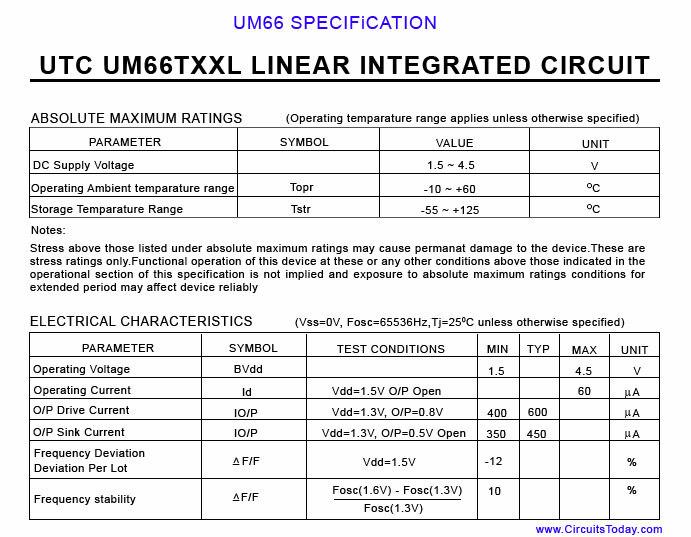 Data sheet of UM66 is there in the datasheet section of the site. I think the explanation i gave is enough to understand the circuit. by slightly modifying this circuit you can get the one you need. If you cant do it yourself, comment here . i will give you the modified circuit. Where can I find the UM66 IC to purchase?